Kumasi, Oct 27, GNA - Otumfuo Osei Tutu II, Asantehene, on Wednesday called on Ghanaians to show more respect for those elected to the high office of President of the country. He described as reprehensible the situation where political opponents insulted and made disparaging remarks about a sitting President. Such behaviour, the Asantehene said, was unhelpful to the peace and growth of democracy, as it tended to create needless tension and polarisation of the society. 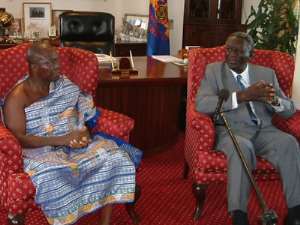 Otumfuo Osei Tutu said this when he received President John Agyekum Kufuor at his Manhyia Palace at the start of his six-day visit to the Ashanti Region. President Kufuor was accompanied by Nana Addo Dankwa Akuffo-Addo, Minister of Foreign Affairs, Mr Jake Obetsebi-Lamptey, Minister of Tourism and Modernisation of the Capital City, Dr Anthony Akoto Osei, a Deputy Minister of Finance and Economic Planning, Mr Sampson Kwaku Boafo, Ashanti Regional Minister and some leading NPP functionaries. Otumfuo Osei Tutu said it was important for all to accept to work together as a people and support whoever was declared winner of a general election to govern the nation. He asked the Politicians to centre their electioneering on issues saying: "What the people want to hear is the way you are going to give them jobs, access to good health and quality education among other things." He said election campaigns should not be reduced to insults and threats. "Let us take a cue from the race to the White House between President George Bush and Senator John Kerry." President Kufuor said critics of his Government should be modest enough to appreciate the significant achievements it had made within the last four years. He said looking back at the economic mess his administration inherited any impartial observer could not fail to recognise that a lot had been accomplished. The President said the Government had now stabilised the economy and the society and deserved to be returned to power. He said when given the mandate for the second term the focus of his Government would be on accelerated economic growth with education, private sector development and health as the major thrust.